Flowstone can provide resin solutions to create fire stations able to withstand the demands of modern fire-fighting together while maintaining a visually-pleasing working environment. When emergency services response stations reach the end of their economic life, they can be failing to meet operational needs, necessitating refurbishment or sometimes complete redesign and reconstruction. A resin flooring solution is becoming increasingly popular within this sector as they have proven ideal in terms of quality, service and product appearance. A resin floor is a popular option for the appliance bay floor, working closely with clients, Flowstone can help you select the right product for this area. We provide an excellent 10 year warranty for all flooring, giving you the peace of mind that you will not have to worry about flooring for a number of years to come, and you can focus on what matters more: providing an excellent education for the nation’s youth. With our warranty, you can be absolutely certain that you are getting great value for money when you buy a floor from us. 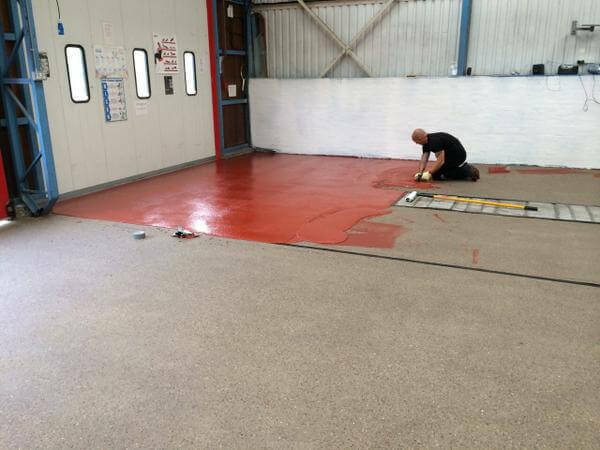 Whether you are a government representative or on a fire station chief, if your station is in need of new flooring, give us a call today to talk about how we can provide flooring with great acoustic properties which will look great and last for years to come! A polyurethane textured screed is a popular choice. They are made for heavy duty areas of potential spillage and increased temperature range. They have excellent resistance to impact and abrasion and to a wide range of chemicals. With a high level of slip resistance, it is ideal for food and drink production areas and heavy industrial applications. The ‘Fast Track’ options have the added benefit of a rapid overnight cure. For the new station’s kitchen, showers and locker rooms, Flowstone can offer both resin and pvc cladding options, offering practicality and low maintenance. Our pvc wall cladding offers impact resistant, grout-free and easy cleaning. It is made from a high-quality, food-safe PVCu polymer that can handle temperatures up to 60°C, and meets all current EU Directives on health and hygiene.